Mr. Denton said that the growing rate of broadband use had created an audience very much in the habit of keeping a laptop open and running as part of their leisure time. And since the majority of the viewers of the company’s sites are people from the ages of 18 to 34, two-thirds of them male, advertisers are beginning to buy in, Mr. Denton said. The idea of grouping the blogs, Mr. Denton said, was to give the company an air of respectability. “It made me want to move to Budapest, batten down the hatches and wait for the zombies to run out of food,” Mr. Denton said cheerily. But as some of its blogs started using many writers, the effect of paying based on the usage of the whole blog didn’t create the right incentives for writers, Mr. Denton said. Mr. Denton said that after a single year of existence, Jezebel has about the same traffic as Gawker and carries more annotation from the commentariat than any other site the company owns. Mr. Denton said that graphic clutter or not, he would be among the people looking in. Mr. Denton said the troublesome advertising market had led to the sale of Consumerist. When he talked to Nick Denton, who owns Gawker among other sites, Mr. Denton said that his sites have also been picked clean by other sites, and suggested that the excerpt was perhaps a little more fulsome than what Gawker usually does. “Scoops pay,” Mr. Denton said. “When an unnamed source misleads, as far as we’re concerned, they lose the right to remain in the shadows,” Mr. Denton said in an e-mail exchange. Mr. Denton said CityFile, which he called a “people directory” of 2,144 notable New Yorkers, would serve as the centerpiece of Gawker’s “new topic and people pages,” part of an effort to increase the Web site’s visitor totals. Mr. Denton said that as exclusive news becomes an ever rarer commodity, the tactical aggression will grow in all corners. “When a writer’s byline is on the Big Board, you see them sometimes just standing there in front of it. Even though nothing is changing,” Mr. Denton said. “Are bloggers journalists? I guess we’ll find out,” Mr. Denton said in an instant message. Mr. Denton said not all writers have warmed to the concept. Mr. Denton said Monday that Deadspin now has an average monthly audience of 2.6 million in the United States, up from 500,000 in 2008. When asked what role Mr. Miller played in the development of Gawker’s new commenting system, Mr. Denton said that Mr. Miller wanted to forge some sort of licensing agreement, but Gawker declined because it was already at work on its own commenting system. Mr. Denton said this in a memorandum that leaked from the company last year, noting that page views were slowing on the company’s sites as people chose to discuss articles on Twitter and Facebook. “The dream of the early blogs was that through conversation we could tell the truth, and if we could discover the truth, we could then have conversations around that truth,” Mr. Denton said. But, as Mr. Denton said, his biggest challenge might not be helping people discover great conversation online, but rather, changing how people perceive online commentary. Mr. Cook will be deputy editor of investigations, a new role spanning Gawker Media’s eight titles, which include Jezebel and Gizmodo, Mr. Denton said in an interview Thursday. He will do “what he did best on Gawker — great big scoops — but across the eight sites,” Mr. Denton said. Mr. Denton said he would stay on as chief executive and remain involved in the company’s future, but that recent failures in management had shown he needed more support. In a long and rambling note, Mr. Denton said that while he was proud that Gawker’s monthly audience had increased 20 percent and its profits had climbed 30 percent, he felt its editorial product was lagging. The managing board will make company decisions by consensus, or majority if consensus can’t be reached and individual members dissent, Mr. Denton said. “A lot of our traffic last year came from stories that we weren’t ultimately proud of,” Mr. Denton said. When someone asked if employees should be prepared for layoffs, Mr. Denton said the risk was difficult to quantify, in part because cases like this are almost always settled or dismissed long before they reach a jury. But in a memo to the staff last year, Mr. Denton said that he had reassessed the drive for traffic above all other considerations. “When we asked him to serve as acting executive editor, we did have a hunch that we’d ask him to take the job permanently,” Mr. Denton said. Mr. Denton said publicly that the site would be “nicer” in the future and less tabloid in its sensibilities. “I think it stands on its own,” Mr. Denton said, “and stands up to the test of time.” Referring to Albert J. Daulerio, the former editor in chief of Gawker who published the video and wrote the accompanying commentary, Mr. Denton said: “He made a contrast between an American icon and the man behind that American icon. I think it was of newsworthy interest” to the site’s readers. Mr. Denton said he was hopeful, like many publishers, that deep “niche” brands have something to offer advertisers. “My own personal hunch is that it’s linked to Silicon Valley,” Mr. Denton said. “Ever since the verdict, this was a likely outcome,” Mr. Denton said in an instant message. 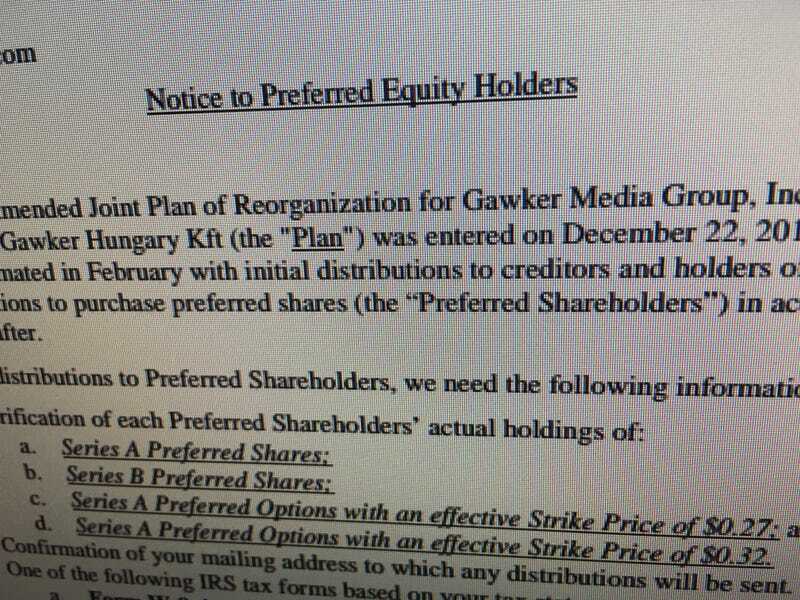 Still, Mr. Denton said his personal bankruptcy would not have much of an effect on Gawker, and he painted an optimistic portrait. “I’m not going to say we lost, but Peter Thiel achieved his objective,” Mr. Denton said, according to a person at the meeting. In his note, Mr. Denton said the company had been unable to find a buyer for the site. “After four years of litigation funded by a billionaire with a grudge going back even further, a settlement has been reached,” Mr. Denton said in a blog post on Wednesday.